Our product range includes a wide range of ball valve with rotary actuator. 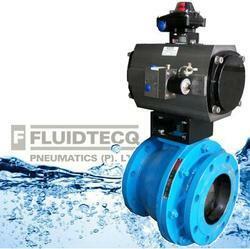 Fluidtecq offers Pneumatic Double Acting / Single Acting Automated Ball Valve actuator package. Ball Valves and ball valve actuator with following range available. Face to Face: as per ANSI B 16.10. We are the leading producer of ball valve actuator. Packaging Details: 3 Tier Wooden box packing, Export packing, Fumigation etc. Looking for Ball Valve Actuator ?